historic cookery | Oh, The Glamourous Life! It seems you all like my cooking posts best (at least according to my site stats), so I’ll endeavor to give you more! This latest recipe is very vintage — it dates back to at least the 18th century! As you, dear Reader, know well, early summer brings cherries to The Manor and a desperate attempt to use them and preserve them. This year I was determined to try Cherry Bounce, a cordial popular in colonial days. It was said to be a favorite of George Washington. Cherry bounce is made with cherries (or any stone fruit, though you’d have to change the name…), sugar, and liquor. Washington liked his with brandy, but you can also use rum or whiskey or vodka. Each adds its own characteristics to the bounce. Sometimes the fruit is used whole, sometimes it’s pressed for its juice. You can also add spices or even fresh herbs. For a lower proof, add some water. I’ve seen so many variations. We used a very simple recipe that’s much like my Christmas fan dance: Sugar Rum Cherry. I wanted to use rum, as it’s very New England and also my favorite spirit. I decided not to add any spices as I feared the results might taste like cough syrup (based on an unfortunate experiment with raspberry cordial once). Take a big glass jar with a lid. Add a pound of sugar and then a little rum to dissolve. Add a pound of cherries and mash them a bit. Pour a quart of rum over it all. Let it sit in a sunny place for a week, then store in a dark place for at least a month. Strain the liquid and pour into bottles. We made two versions, each with 2 pounds of sugar, 2 pounds of cherries, and a 1.75 L bottle of rum. The first was a white rum and we put the cherries in whole and then bashed them around with a spoon after the rum was added. 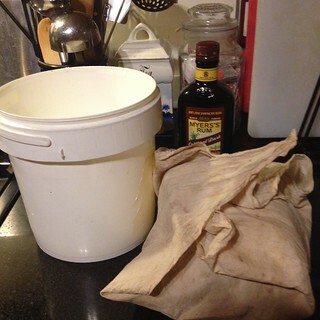 The second was gold rum and we bashed the cherries into the sugar with a potato masher before adding the rum. 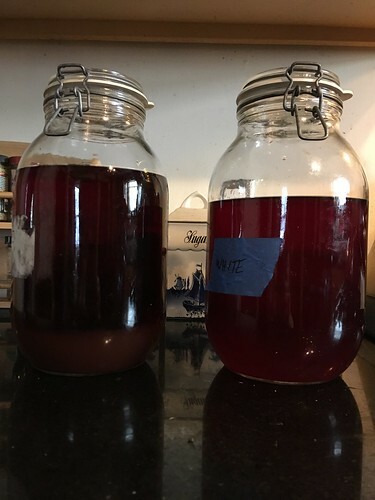 We let the jars of bounce sit for a week in the pantry and I would stir them every day to make sure the sugar stayed in solution and further bruise the cherries. Then we stashed them in a cabinet for about 2 months. I strained out the cherries and poured the bounce back into the jars. The white rum bounce is pretty clear, but the gold, where the cherries were crushed, has a lot of sediment. I need to find some attractive bottles to decant the bounce into. When I bottle it, I’ll strain it too (coffee filters work well for that). So, how does it taste? Very good. It’s intensely cherry. I think the white is actually more cherry-flavored than the gold. The gold has more of a boozy taste. And they’re both quite strong. It’s a nice dessert tipple to be drunk out of wee glasses. I’m sure some creative sort could come up with a cocktail that uses cherry bounce. I was going to toss the cherries, assuming they had given up all their cherry goodness and no longer tasted like anything. However, upon sampling, they still taste like cherries and very much like rum. I pulled out all the whole ones and froze them. They’ll be great over ice cream. Maybe I’ll even flame them like cherries jubilee. Despite the name, it’s mostly recipes to impress your friends and your parents. There’s a lot of reliance on packaged foods (this is the 1950s after all! ), especially cake mixes. The first chapter is snacks to keep in your icebox for the hungry midnight raider. 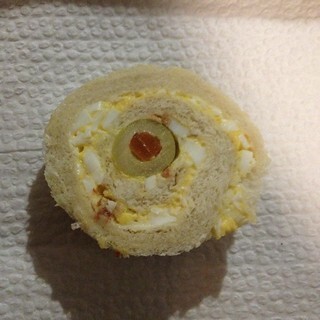 I made Bedroll Special, a pinwheel sandwich. You need bacon, eggs, mayonnaise, butter, olives, and a loaf of unsliced bread. Start by hard boiling the eggs and cooking the bacon. Chop the eggs fine and crumble the bacon. Mix with mayonnaise. Then comes the tricky part. Cut off all the crusts, except the bottom one, from the bread. Then cut two thin slices lengthwise from the top. The only unsliced loaf I found at my nearby supermarket was Italian bread which turned out to be too irregularly shaped and squishy to make thin, even slices. I got rather raggedy results, which I ran over with a rolling pin to make flatter and more even. If I do anything like this again, I’ll get an unsliced sandwich loaf from our local Irish bakery. Spread each slice with softened butter, then spread with the mayo mixture. Get close to the edge. At this point in the recipe you were supposed to go over it with a rolling pin, but I didn’t want to get goop all over mine and the slice was already pretty flat. Place olives in a row along one short end and then roll the bread up. Wrap each roll in a piece of wax paper and twist the ends to make a little sandwich bonbon. Stash in the fridge for at least 2 hours. Before serving, take the rolls out of the fridge and unwrap them. Slice cross-wise into rounds (a serrated knife works well for this). You can cut the ends off first if they’re not so tidy. Pile the rounds onto a serving platter. 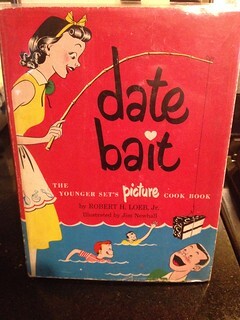 The cookbook had a little banner that said “You’re For Me”, which you could cut out, glue to a toothpick, and plant in the middle of the stack of sandwiches before replacing them in the fridge for your midnight snacker to find. Instead of a lovely platter, I put them in a tupperware so they wouldn’t dry out and to make them easier to transport to rehearsal. My presentation is often less than elegant. They’re pretty good. My taste testers were quite positive. The filling is completely unseasoned, so the salty, briny, and smoky flavors from the olives and bacon were necessary. Hard boiling the eggs. Let cool. Cook the bacon until crisp and drain. 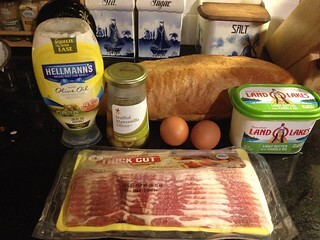 Crumble bacon into a bowl and mix in mayonnaise. Chop eggs fine and add to mixture. Cut off all the crusts, except the bottom one, from the bread. Then cut two slices 1/8″ thick lengthwise from loaf. Spread each slice with softened butter, then spread with the mayo mixture. Get close to the edge. Roll bread with a rolling pin to flatten. Place olives in a row along one short end and then roll the bread up. Wrap each roll in a piece of wax paper and twist the ends securely. Refrigerate for at least 2 hours. Before serving, take the rolls out of the fridge and slice (a serrated knife works best) cross-wise into rounds. Pile the rounds onto a serving platter. 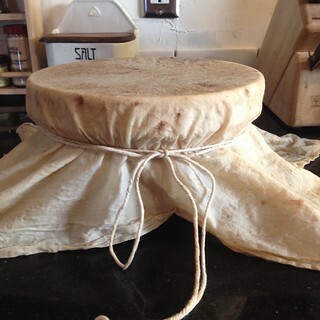 If not serving right away, keep under a damp tea towel to keep the bread from drying out. It’s been rather hot so far this summer. A perfect time for icy-cold treats! The other day I made some delicious mocha marlow. “Marlow?” you ask, “What’s marlow?” Like its equally obscure cousin mallobet, it’s a frozen dessert made with a marshmallow base. I’ve definitely dated this style of dessert back to the 1920s (Clara Bow contributed a recipe for Vanilla Marlow to a 1929 movie star cookbook), but it may go further back to the earlier days of ice boxes. These desserts were still being made into the midcentury, but seem to have then died out completely. Both marlows and mallobets are made with melted marshmallows. Marlows get their fluffiness from whipped cream, while mallobets (marshmallow-sherbet) contain stiffly beaten egg whites. You don’t need an ice cream maker for these concoctions, which was part of the appeal, I think. I made this marlow on a terribly hot day and I must confess that cooking everything over boiling water was torture, but the end result was worth it. Start by cutting 16 marshmallows into quarters. It’s easiest to use kitchen shears or a knife dipped in hot water. Don’t substitute mini-marshmallows because you’ll end up with the wrong ratio of cornstarch (which coats the outside of the marshmallows) to marshmallow. Set a saucepan over boiling water and melt the chocolate. 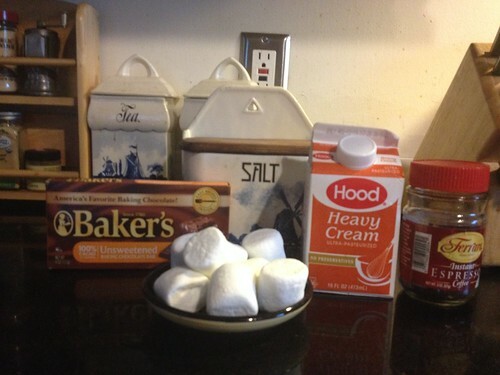 Then fold in the marshmallows and a cup of strong coffee and a pinch of salt. I don’t drink coffee so I never have any just hanging about. I made instant espresso instead. Keep folding the mixture. When the marshmallows are about half melted, take them off the heat and keep stirring until they completely melt. Make sure everything is well combined and let it cool. I stuck the pan into a bowl of ice water to help it cool down faster on such a hot day. Then whip cream until it’s stiff and fold into the cooled mocha mixture and add toasted nuts. I think toasting nuts before using them is always a good idea; they just taste better. The first time I made this I used slivered almonds since that’s what I had on hand, but hazelnuts add a lovely Nutella flavor. If you’re one of those people who doesn’t like bits of stuff in their ice cream, you can certainly leave the nuts out. 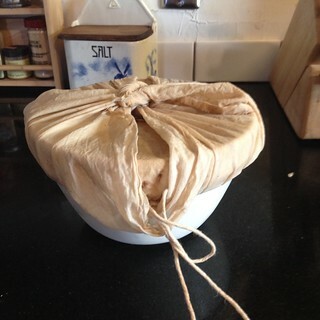 Spoon the mixture into a container — I recommend a metal loaf pan — cover it, and stick it in the freezer. When it’s about half frozen (use your best judgement), give it a stir. 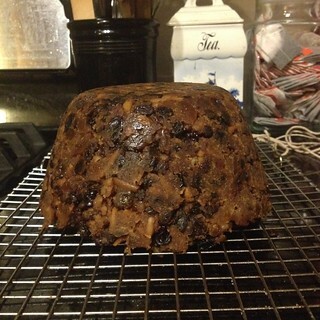 It will take a couple of hours to firm up enough to serve. Melt chocolate over boiling water. Add marshmallows, coffee, and salt. Fold mixture continuously over and over until marshmallows are half melted. Remove from heat and continue folding until mixture is smooth. Cool. Whip cream. Add whipped cream and nuts to mocha mixture. Pour into metal loaf pan, cover, and freeze until firm, stirring at least once. The novelty for this cake is that it’s made with graham cracker crumbs instead of flour. The recipe comes from the pamphlet 100 Delicious Walnut Recipes by the California Walnut Growers Association, probably published in 1920. I’ve also found a similar recipe for the cake (but not the frosting) in a Utah newspaper from 1915. We had a box of graham crackers left over from making s’mores at the Mini Expo cook out and I wanted to make something for our Sunday Social after Cover Girls. This fit the bill nicely. Take the butter and eggs out of the fridge early and let them come up to room temperature. It will be easier to cream the butter and to beat the egg whites stiff when they’re not so cold. Toast the nuts first. Toasted nuts always taste better. Also, get as much of the skin off the walnuts as possible — it can be bitter. Obviously the Walnut Growers want you to use walnuts, but the cake is probably just as good with other nuts or no nuts at all. 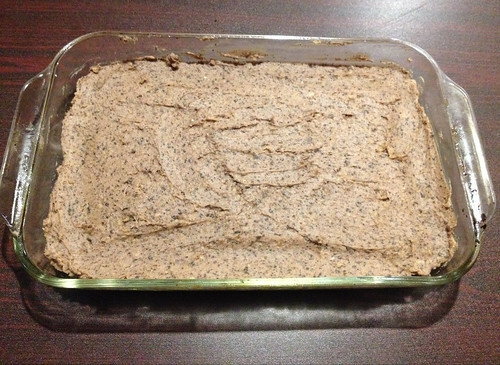 Most vintage recipes call for squares of unsweetened chocolate, which was an ounce. These days chocolate usually comes in bars with 4 squares to the ounce, but double-check and use a scale if you’re in doubt. One of the challenges was figuring out how many graham crackers to use. 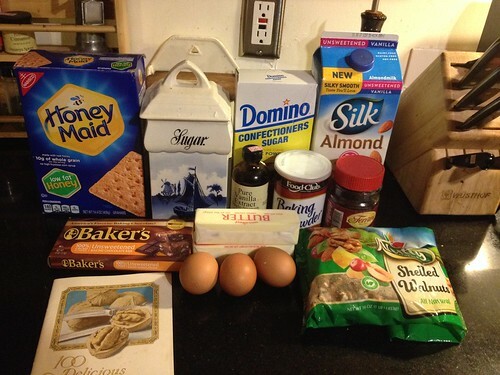 The recipe calls for “26 graham crackers”. Is one cracker one of the rectangular cracker quarters? The square half crackers, like for s’mores? Or an entire unbroken cracker sheet? The right answer seems to be 26 square crackers aka 13 full cracker sheets. Crush graham crackers to fine crumbs. I like to use a rolling pin, but it’s faster and more uniform if you use a food processor. Separate eggs and beat whites to stiff peaks. Mix sugar & baking powder, then cream with butter. 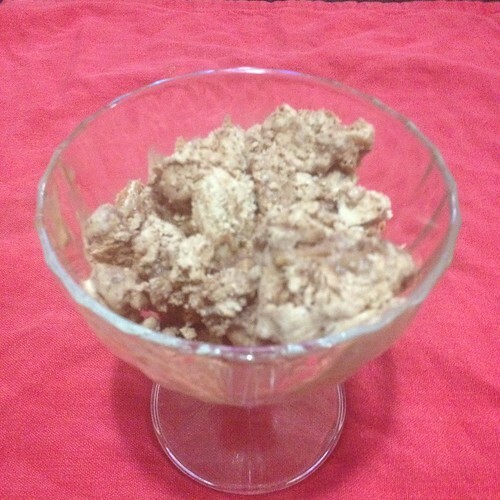 Mix together egg yolks, milk, vanilla, cracker crumbs, and nuts. Fold in beaten egg whites. Pour batter into buttered pans. The original recipe says just to “bake in loaf or layers”. A little research lead me from this vague instruction to the appropriate size and shape of pans and the temperature and time. Let cool before frosting. See recipe below for specifics. To make the frosting, cream butter and powdered sugar. Add melted unsweetened chocolate. Add enough cold coffee to make the frosting spreadable. I don’t drink coffee so I don’t usually have left-over coffee hanging about. I use instant espresso powder for intense flavor and make a single cup. I used about 1/4 cup of cold espresso, but the amount will depend on what consistency you like your frosting and a bit on how humid it is. Finally, mix in ground walnuts. Frost the cake(s). If you used round cake pans, level the layers before frosting and stacking (or use cake bands so you don’t have to). It went over really well. Someone tasting the cake said the cake and the frosting have the right balance of sweet. Everyone loves the mocha frosting. Mix sugar and baking powder. Cream with butter. Add egg yolks, milk, graham cracker crumbs, walnuts, and vanilla. Beat egg whites to stiff peaks and fold in. Bake in greased pans: two 9″-round pans or two loaf pans or a 13×9″ rectangular pan for 30 minutes at 350F. Let cook and frost with Mocha Nut Frosting. Cream butter and sugar. Add melted chocolate. Add enough coffee to make a spreadable consistency. Stir in ground nuts. 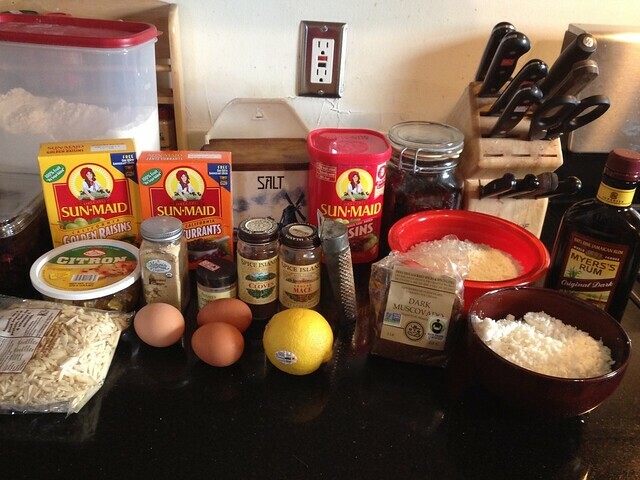 I’m sorry it’s been so long since I shared a recipe with you. Last month was kind of a crazy one and I was barely in the kitchen. However, there should be more cooking in the near future. You know I love old cookbooks of any kind, but when it comes to 20th century cooking I have a particular fondness for the recipe pamphlet. My collection includes “100 Delicious Walnut Recipes” by the California Walnut Growers Association and “The Exciting World of Rice Dishes” from Minute Rice. I have them all. 24 pamphlets to add to my cookbook project. In this project, which has been going on for years, I need to cook one recipe, which I’ve never made before, out of every cookbook in my collection. This project brought you such delights as Frozen Fruit Salad, Cashew Chicken, and Peach Mousse. Fortunately, I’ve already cooked from three of them and two of them have no recipes (one has menus, the other food facts), but that still means I’ve got a lot of recipes to make. Perhaps some of them will even make it onto these pages. Perhaps some Luscious Refrigerator Desserts or Superb Pies and Pastries. So many possibilities! For a couple of weeks in late June and early July, it’s sour cherry season at The Manor. We are constantly picking, pitting, and cooking cherries from the orchards (all right, it’s just one tree). I’m always on the lookout for new and interesting cherry recipes to add to our arsenal of favorites. 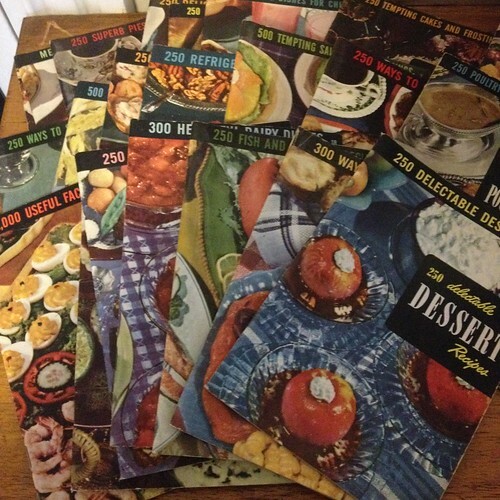 Recently Scratch gave me a clutch of vintage recipe pamphlets which included Good Housekeeping’s Around the World Cookbook: specialty recipes with a foreign flavor. I was surprised at the variety of countries represented and the sophistication of the recipes, especially compared to some other cookbooks of the era and their idea of “international” cuisine. Hungary was one of the countries well represented with many recipes. Since Scratch was recently in Budapest, Spiced Cherry Soup (Hideg Cseresnyeleves in Hungarian) sounded perfect. It specifically calls for sweet cherries, but of course I used our sour ones. Pit and stem cherries. Remove strips of zest (no white pith) from half a lemon. Stick whole cloves into the peel. 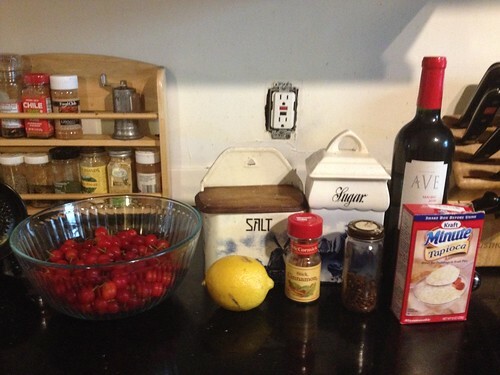 Put the cherries and lemon peel into a sauce pan along with a cinnamon stick, some sugar, salt, and water. Simmer. Stir in tapioca and bring to a boil. Add red wine then remove from the heat and allow to cool. Remove lemon peel, cloves, and cinnamon then chill. Serve cold garnished with a thin lemon slice and a dollop of sour cream. It make a deliciously tart and refreshing soup, great as a starter or as dessert. The tapioca thickens it, but doesn’t make it utterly gloppy, which I had feared. I think the lemon garnish is optional, but the sour cream (in the original recipe as “commercial sour cream”) is mandatory. I made only one change (besides using sour instead of sweet cherries). In the original recipe, you add the wine after taking the soup off the heat. I find the raw alcohol taste unpleasant and prefer to let it simmer for another moment or two to cook out some of that harshness. With vegetable peeler, remove peel from lemon in strips; stick cloves into peel. In saucepan, combine cherries, lemon rind with cloves, cinnamon, sugar, salt, water. Simmer, uncovered, 15 for minutes. 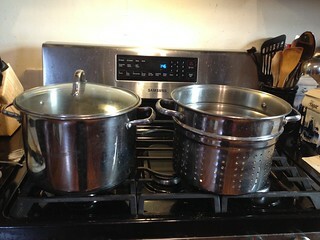 Gradually stir in tapioca; bring to boil; then stir in wine; remove from heat; allow to cool. Remove and discard lemon peel, cloves, and cinnamon; then refrigerate until serving time. To serve, ladle ice-cold soup into individual soup bowls or plates; top each serving with a lemon slice and spoonful of sour cream. It’s been a while since I did any really historic cooking. This late 18th century recipe for asparagus bits in a savory custard sauce served inside a hollowed-out loaf of bread makes a delightful light supper or, as recommended, a side dish. Asparagus forced in French Rolls. Cut a piece out of the crust of the tops of three French rolls, and take out the crumb; but be careful that the crusts fit again in the places from whence they were taken. Fry the rolls brown in fresh butter: then take a pint of cream, the yolks of eggs beat fine, and a little salt and nutmeg. Stir them well together over a slow fire till it begins to be thick. Have ready an hundred of small grass boiled, and save tops enough to stick the rolls with. Cut the rest of the tops small, put them into the cream, and fill the loaves with them. Before you fry the rolls, make holes thick in the top crusts to stick the grass in. Then lay on the pieces of crust, and stick the grass in, which will make it look as if it were growing. This makes a very handsome side-dish at a second course. The original recipe makes three loaves, but I cut it down to one, as is my wont. “Forced” (sometimes spelled “farced”) means stuffed. Asparagus was well known in the classical world, where it was called “asparagus” by the Romans. The Emperor Augustus is reported to have said “celerius quam asparagi cocuntur” (“quicker than cooking asparagus”) to describe something done very fast. The vegetable didn’t become popular in northern Europe until the 16th century. The English, because they’re like that, mutated the perfectly good Latin name into “sparrow grass” or just plain “grass”, as did our author above. I start with a small loaf of French bread (you don’t want to use a baguette for this — it’s too long and skinny) and cut a big rectangle out of the top crust. Be careful not to break it when removing (done that). Carefully scoop out all the bread inside without cutting through the crust. I just pull it out with my fingers and maybe use a spoon for the last bits. I save the innards for something that needs bread crumbs. Poke a bunch of holes in the top crust. They should be just big enough to hold an asparagus stalk. Then melt some butter in a skillet and fry the bread until it is toasted. There’s no butter in the above photo because I forgot it in the fridge. The lid is easy to fry, but the loaf is a bit awkward. I like to brush the interior of the loaf with some of the melted butter. Cook asparagus until it’s just tender. This doesn’t take long (see the Latin quote above) If you don’t have your favorite method, you can see how I cook them here. Cut the cooked asparagus into small pieces. I think I usually cut them about an inch long. Reserve as many asparagus tips as holes poked in the bread lid. Warm some cream in a small saucepan. I was using light cream, but you can use heavy cream for a creamier custard. I don’t like whipping cream because it has thickeners added to it. Beat an egg yolk in a small bowl. When the cream gets hot, temper the egg yolk by added a little cream to the egg, beating the whole while. Add the egg/cream mixture back into the cream. Season with salt and grated nutmeg (also missing in the picture — where was my head?). Cook custard over low heat until it thickens a bit. Add the asparagus bits to the saucepan and remove from heat. You don’t want the asparagus to cook more, just warm up a touch. Spoon the asparagus-custard mixture into the loaf. Take the reserved tips and stick them into the holes you poked in the lid. Put the lid on the loaf. Voila! It looks like a little grassy hill. Adorable! I end up cutting this into very messy, but delicious, slices, because the custard oozes out as soon as the structural integrity of the loaf is breached. I suppose one could treat it like a bread bowl, where the loaf is primarily a serving vessel, but I like the combination of bread, custard, and asparagus in each bite. Cut out a lid from the top crust of the loaf. Carefully scoop out all the bread inside without damaging the crust. Cut several holes in the lid. Melt a little butter in a skillet, about a tablespoon or so, and fry the bread until it is toasted. Cook asparagus until tender. Cut the cooked asparagus into small pieces. 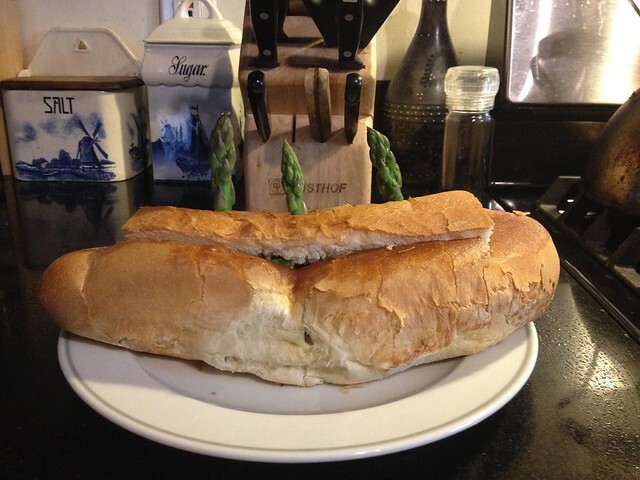 Reserve as many asparagus tips as holes poked in the bread lid. Warm cream in a small saucepan. Temper egg yolk and add to cream. Season with salt and freshly grated nutmeg. Cook over low heat until sauce thickens. Add the asparagus bits to the mixture and remove from heat. 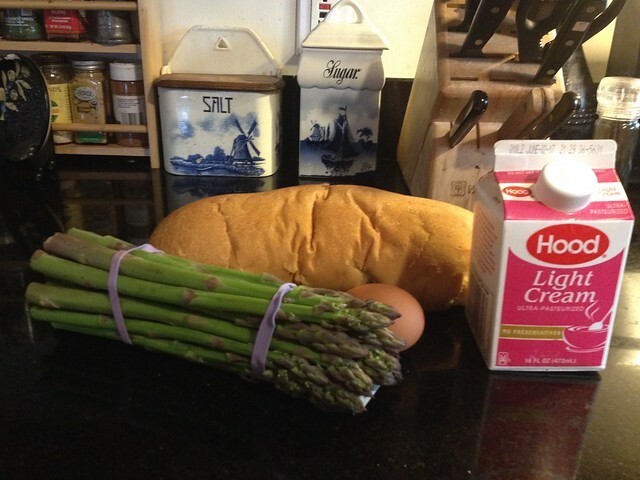 Spoon the asparagus-custard mixture into the loaf. Take the reserved tips and stick them into the holes cut in the lid. 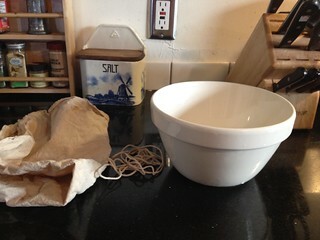 Replace the lid on the loaf. Serve.